Background and objectives Medicare reimbursement policy encourages frequent provider visits to patients with ESRD undergoing hemodialysis. This study sought to determine whether more frequent face-to-face provider (physician and advanced practitioner) visits lead to more procedures and therapeutic interventions aimed at preserving arteriovenous fistulas and grafts, improved vascular access outcomes, and fewer related hospitalizations. Design, setting, participants, & measurements Multivariable regression was used to evaluate the association between provider (physician and advanced practitioner) visit frequency and interventions aimed at preserving vascular access, vascular access survival, hospitalization for vascular access infection, and outpatient antibiotic use in a cohort of 63,488 Medicare beneficiaries receiving hemodialysis in the United States. Medicare claims were used to identify the type of vascular access used, access-related events, and vascular access failure. Results One additional provider (physician and advanced practitioner) visit per month was associated with a 13% higher odds of receiving an intervention to preserve vascular access (95% confidence interval [95% CI], 12% to 14%) but was not associated with vascular access survival (hazard ratio, 1.01; 95% CI, 0.99 to 1.03). One additional provider visit was associated with a 9% (95% CI, 5% to 14%) lower odds of hospitalization for vascular access infection and a corresponding 9% (95% CI, 5% to 14%) higher odds of outpatient intravenous antibiotic administration. However, the associated changes in absolute probabilities of hospitalization and antibiotic administration were small. Conclusions More frequent face-to-face provider (physician and advanced practitioner) visits were associated with more procedures and therapeutic interventions aimed at preserving vascular accesses, but not with prolonged vascular access survival and only a small decrease in hospitalization for vascular access. More than 600,000 patients in the United States have ESRD (1). These patients experience high mortality and morbidity and poor health–related quality of life (1,2). Patients with ESRD consume a disproportionate share of health care resources; despite making up only 1.3% of the Medicare population in 2011, they accounted for 6.2% of Medicare expenditures (1,3,4). Vascular access complications account for approximately 10% of total ESRD program costs (5,6). Patients receive hemodialysis through a large-bore central venous catheter or an arteriovenous (AV) fistula or graft. Observational studies demonstrate enhanced survival when patients receive hemodialysis through an AV fistula or graft compared with a catheter (7–12). To improve vascular access survival and prevent complications, many dialysis care providers have implemented vascular access surveillance programs. However, it is unclear whether monitoring improves the functional lifespan of AV fistulas and grafts. Several small trials of access surveillance have demonstrated reduced access thrombosis (13) and temporary extension of cumulative patency of AV fistulas and grafts (14), while other trials yielded no significant effects (15,16). In 2004, the Centers for Medicare & Medicaid Services enacted a physician reimbursement policy that encourages more frequent outpatient hemodialysis care (17). One potential benefit of more frequent visits from physicians is that they may lead to physicians recognizing vascular access difficulties and ordering an intervention to preserve or enhance the vascular access. Care providers might also identify and treat vascular access infections before they become severe enough to require hospitalization. We hypothesized that more frequent face-to-face visits with physicians and advanced practitioners lead to more testing and procedures aimed at preserving AV fistulas and grafts. Additionally, we examined whether more frequent visits improve survival of AV fistulas and grafts, reduce hospitalizations for vascular access infection, and increase the use of outpatient antibiotics to treat vascular access infections. We assembled a cohort of patients starting in-center hemodialysis in the United States between 2004 and 2009 who were 67 years of age or older at dialysis initiation, had Medicare parts A and B primary coverage in the 12 months before and at the start of hemodialysis, and received hemodialysis through an AV fistula or graft. We obtained data from the US Renal Data System, a registry of nearly all patients with treated ESRD in the United States. We selected patients age 67 years and older because of the availability of Medicare claims in the 2 years before start of dialysis. We used Medicare claims before and following initiation of hemodialysis to ascertain when patients began receiving hemodialysis using an AV fistula or graft. We identified procedure codes for placement of a hemodialysis graft, upper arm fistula, or forearm fistula, in addition to tunneled catheter placement and removal (Supplemental Appendix, Supplemental Table 1) Unless a tunneled catheter was present, we assumed that patients began receiving hemodialysis through AV fistulas 90 days after fistula creation. Likewise, we assumed that patients began receiving hemodialysis through AV grafts 21 days after graft placement. When both a tunneled catheter and an AV fistula/graft were present, we assumed that the patient received hemodialysis through the tunneled catheter until it was removed. To confirm the validity of our methods, we compared rates of AV fistula and graft survival at different time intervals to rates reported in published literature and compared the access used at dialysis initiation that we ascertained from pre-ESRD Medicare claims to that reported in the Centers for Medicare & Medicaid Services Medical Evidence Report (Supplemental Appendix, Supplemental Figure 1, Supplemental Table 2A–C) (7,18). We tracked each patient from the beginning AV fistula or graft use for 3 years or until January 1, 2010; a change in dialysis modality, kidney transplantation, death; or vascular access failure. We defined vascular access failure using Medicare claims when a new AV fistula was created or a graft or tunneled catheter was placed (Supplemental Table 1). We ignored placement of temporary dialysis catheters because this procedure does not necessarily represent failure of an AV fistula or graft; patients may have temporary dialysis catheters placed during a hospitalization or while waiting for a vascular access procedure (thrombectomy, thrombolysis, and/or venoplasty) but then resume use of their AV fistula or graft upon discharge. The primary outcome was whether an intervention was performed to preserve a patient’s vascular access. These “access-preserving” interventions included any intervention to a vascular access (surgical, diagnostic, or endovascular) except for thrombolysis or thrombectomy. We excluded these latter interventions in our primary analysis because they are typically done out of necessity when a vascular access no longer functions and are less likely to directly result from closer clinical monitoring. A secondary outcome was time to failure of vascular access. We also examined hospitalizations for vascular access infection, where vascular access infection was the primary International Classification of Diseases, Ninth Revision, diagnosis code for the hospitalization or where vascular access infection occurred in conjunction with a primary diagnosis of sepsis. Finally, we examined administration of antibiotics during outpatient hemodialysis to treat a vascular access infection (Supplemental Table 1). The study exposure was the frequency with which hemodialysis care providers (physicians and advanced practitioners) visited with patients face to face in the outpatient setting. We obtained outpatient provider visit frequency for each month from Medicare claims. Because claims captured zero, one, two to three, or four or more outpatient visits, we assigned claims for two to three visits a value of two and a half visits, and claims for four or more visits a value of four visits. Because the numbers of visits in more recent months are most likely to affect vascular access outcomes in a given month, we used a 3-month moving average of visits. To avoid the problem of “reverse causation,” whereby a failed vascular access prompts a hemodialysis care provider to see a patient more frequently to evaluate the failed access, we examined the moving average of visit frequency in the 3 months leading up to—but not including—each month of interest. We used multivariable regression to control for patient, dialysis facility, and geographic characteristics. We determined whether comorbid conditions were present based on 12 prior months of Medicare claims and the Medical Evidence Report completed when patients develop ESRD. Facility characteristics were obtained from the annual dialysis facility survey, while population density came from census-based rural-urban commuting area codes (19). Because of the large population size, we used a 10% standardized difference as a marker of heterogeneity when comparing differences in characteristics between groups (20). On average, patients who are hospitalized are seen less frequently in the outpatient setting in the month of hospitalization because they are not at their outpatient dialysis facility for as many treatments. This inverse association between hospitalization and visit frequency, along with the possibility that hospitalizations are associated with our study outcomes, makes hospitalizations an important potential confounder. To address this issue, we included the number of days spent in the hospital over the past 3 months as a covariate. We included hospital days as a time-varying covariate in our survival analysis and calculated it for each patient-month in logistic regression analyses. We also evaluated for potential interaction between the 3-month moving average of visit frequency and the number of hospital days in the prior 3 months to adjust for potential differences in the relative importance of visits in months when patients are hospitalized. Because associations between visit frequency and vascular access outcomes may be different for patients with AV fistulas and grafts, in stratified analyses we examined these associations separately. Additionally, we tested for an interaction between visit frequency and vascular access type. We used multivariable logistic regression analyses to evaluate the association between monthly visit frequency and (1) the odds of a vascular access–preserving intervention, (2) the odds of hospitalization for vascular access infection, and (3) the odds of receiving intravenous antibiotics during outpatient hemodialysis to treat a vascular access infection. We included all months in the study period and controlled for the time elapsed since vascular access placement as a categorical variable broken down by quartiles. We used Cox regression to determine the association between visit frequency and time to vascular access failure. We used cluster-robust SEMs to account for correlation among repeated measures and clustering of errors within dialysis facilities (21,22). In a secondary analysis, we explored whether reduced hospitalizations mediate the causal pathway between more frequent provider visits, vascular access survival, and vascular access interventions. The results from this analysis were consistent with those from our primary analysis, suggesting that hospitalizations are not a mediator of the relation between visit frequency and vascular access survival and interventions. For additional information about study design, sensitivity analyses, and detailed study results see the Supplemental Appendix (Supplemental Tables 3–6). The institutional review board of Stanford University School of Medicine approved this study. We used SAS Software (Cary, NC) to construct the data set, and performed statistical analyses using STATA (College Station, TX). There were 63,488 patients included in our cohort (Figure 1). Median follow-up duration was 385 days (25th, 75th percentile range, 169–764 days). About 50% of patients underwent procedures to repair AV fistulas or grafts during the follow-up period. Among patients who had a procedure to repair a fistula or graft, 41% underwent one procedure, 22% underwent two, and 37% underwent three or more. Black patients were more likely to have their access repaired than nonblack patients; there were no differences among other races or ethnicities. Patients spending more days in the hospital were less likely to have their vascular access repaired, and patients receiving hemodialysis with a forearm AV fistula were less likely to receive access repair than patients with an upper arm fistula or graft (Table 1). Study population selected from incident patients with ESRD. 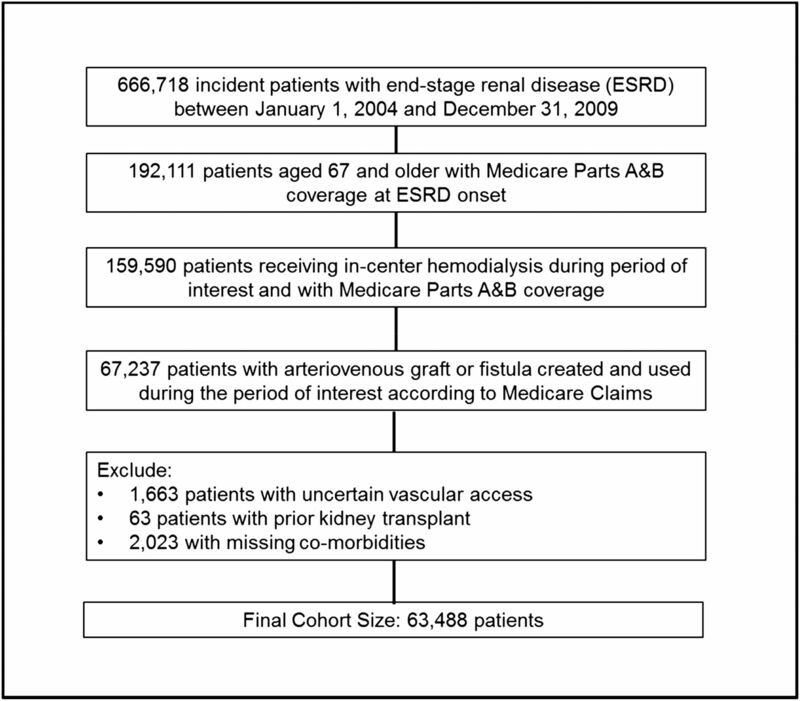 Of 666,718 patients who developed ESRD between January 1, 2004, and December 31, 2009, we selected 63,488 for this analysis. Vascular accessed failed in approximately 26% of patients during 3 years of follow-up. Vascular access failure was less likely in men and more likely in black patients relative to women and nonblack patients, respectively. Arteriovenous grafts were more likely to fail than AV fistulas (Table 1). During the follow-up period, 2.6% of patients were hospitalized for AV fistula or graft infection, while 5.7% of patients received antibiotics during outpatient hemodialysis to treat an infected fistula or graft. Provider visit frequency did not differ by demographic characteristics or patient characteristics, except that more hospital days were associated with fewer outpatient visits, as expected. Larger dialysis facilities were associated with more frequent visits (Table 2), as previously shown (23). Figure 2, A and B, and Table 3, illustrates unadjusted graft and fistula survival. Vascular access survival difference by visit frequency is small: above- and below-median visit frequency. (A) Arteriovenous (AV) fistula graft survival. (B) AV graft survival. Visits were divided into upper and lower halves of mean visits. “Fewer” visits refer to patients with ≤3.6 visits per month, while “more” visits refer to patients with >3.6 visits per month. P values for log-rank test of equivalence of survival distributions were 0.02 for grafts and 0.001 for fistulas. One additional face-to-face provider visit per month in the previous 3 months was associated with a 13% (95% confidence interval [95% CI], 12% to 14%) higher odds of having an access-preserving intervention in a given month. On the basis of these results, an increase from three to four visits per month, averaged across the entire cohort, would correspond to a 0.9% higher absolute probability of receiving an access-preserving intervention in a given month (Figure 3, Table 4, Supplemental Figure 2). The association between visit frequency and vascular access repair was nearly identical in analyses stratified by vascular access type, and there was no significant interaction between visit frequency, vascular access type, and vascular access repair (Supplemental Table 7). Additionally, the association between visit frequency and vascular access repair did not depend on the number of days patients spent in the hospital in the preceding 3 months (Table 4). Predicted probability of vascular access repair increases with more frequent visits, while probabilities of vascular access failure, access preserving interventions, and hospitalization for vascular access infections are largely unchanged. Probabilities were obtained by averaging predicted probabilities across the entire study population. From logistic regression results, monthly probabilities were converted to annual probabilities multiplicatively, while accounting for differences in time since vascular access placement over the course of a year. To estimate annual probabilities of vascular access survival, we used a parametric survival model assuming an exponential survival distribution. (See Supplemental Appendix, “Methods for Creating Figure 3,” as well as Supplemental Tables 11 and 12). Neither graft nor fistula survival was improved by more frequent visits (hazard ratio, 1.01; 95% CI, 0.99 to 1.03) (Figure 3, Supplemental Table 8), despite the association between visit frequency and procedures aimed at preserving vascular access. Stratified analyses (by vascular access type: AV fistula or graft) also showed no significant associations (Supplemental Table 7); moreover, the access type×visit frequency interaction was not statistically significant. 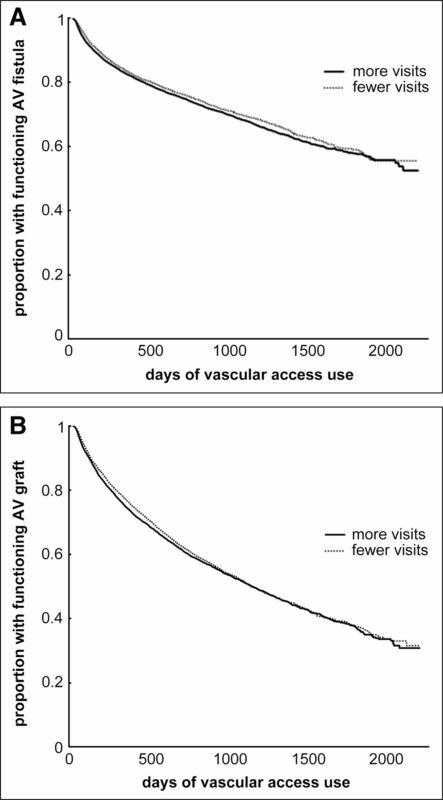 The association between visit frequency and vascular access survival did not depend on the number of days patients spent in the hospital in the preceding 3 months. One additional provider visit was associated with a 9% (95% CI, 5% to 14%) lower odds of hospitalization for vascular access infection and a corresponding 9% (95% CI, 5% to 14%) higher odds of outpatient intravenous antibiotic administration (Supplemental Tables 9 and 10). When we considered both infection-related outcomes, recent hospitalization modified the observed associations. With more days in hospital, the association between higher visit frequency and hospitalization for vascular access infection was less pronounced (P<0.001), whereas the association between higher visit frequency and use of outpatient antibiotic prescription was more pronounced (P<0.001) (Figure 3, Supplemental Tables 9 and 10). Because of the relatively low incidence of hospitalizations for vascular access infections and outpatient antibiotic administration, the expected changes in absolute probability of these events from one additional visit was small. On average, the difference between three and four visits per month was associated with a 0.015% per month lower absolute probability of hospitalization for vascular access infection and a 0.044% per month higher absolute probability of receiving outpatient antibiotics. A graphical illustration of the main findings indicates that more frequent visits are associated with an increase in the probability of vascular access–preserving interventions over 1 year with no appreciable effect on vascular access survival and a slight improvement in the probability of hospitalization for vascular access infection (Figure 3, Supplemental Tables 11 and 12). We examined the sensitivity of our analyses of vascular access repair and vascular access survival to the following assumptions: (1) Claims for two to three visits in a month represent two and a half visits; (2) visits in the most recent month do not influence vascular access outcomes; (3) more frequent visits do not modify the rate of thrombectomy and thrombolysis; (4) dialysis facilities with varying levels of visit frequency do not systematically differ in their vascular access monitoring and intervention practices, and (5) AV fistulas are used after 90 days and grafts are used after 21 days. In all instances the observed association (or absence of association) was not materially changed (Supplemental Appendix: Sensitivity Analyses). In the current reimbursement model for outpatient hemodialysis, providers have an incentive to see patients frequently: up to four times per month. While more frequent visits may be associated with reduced rates of hospitalizations, they have not been found to improve other health outcomes, such as mortality and health-related quality of life (24–26). 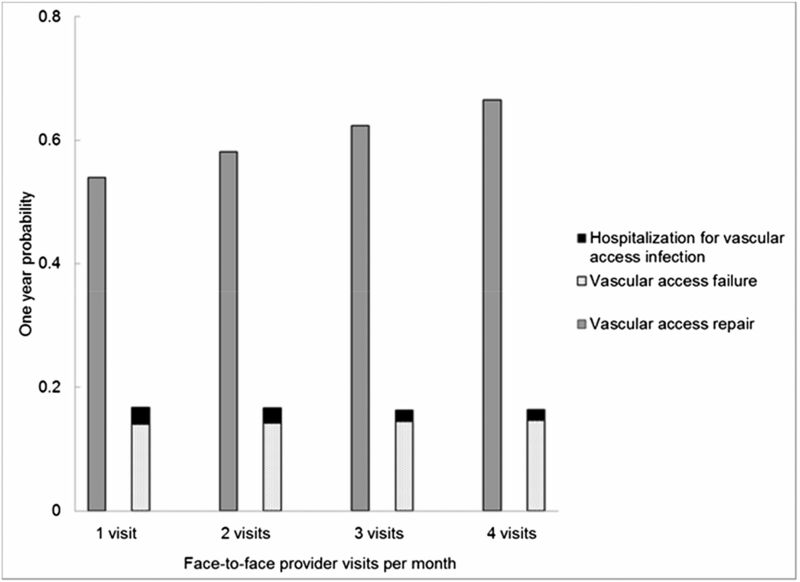 This study demonstrates that increased face-to-face provider visits were associated with an increase in the frequency of procedures aimed at preserving vascular access, but not with improved vascular access survival. The finding that more frequent provider visits were associated with higher healthcare utilization (i.e., more frequent interventions to preserve vascular access) with no significant improvement in health outcomes is consistent with numerous findings in other areas of medical care. For instance, the Dartmouth Atlas project comparing regional differences in end-of-life care suggested no direct association between medical spending and quality of care (27,28). Our results are consistent with prior analyses demonstrating no relation between more frequent outpatient hemodialysis provider visits and other major health outcomes, including mortality and referral for kidney transplantation (24–26). Our findings expand on a body of evidence suggesting that formal monitoring of vascular access may lead to more frequent interventions without improving overall vascular access survival. Two randomized controlled trials found that regular monitoring of vascular access blood flows and ultrasound monitoring led to more frequent interventions aimed at preserving vascular accesses, with no effect on access survival (13,15). A third randomized controlled trial found that frequent monitoring of static venous pressures did not change overall access survival (16). We found that more frequent visits were associated with reduced odds of hospitalization for vascular access infection and more frequent treatment of vascular access infections in the outpatient setting. These results are consistent with prior analyses demonstrating that provider visit frequency is associated with fewer all-cause hospitalizations and rehospitalizations (25). The absolute reduction in the probability of hospitalization for vascular access infection was small but could be related to earlier identification of infection and initiation of antibiotic therapy at the dialysis facility that averted hospitalization. To place this apparent benefit in context, an increase from three to four visits per month would be expected to lead to 54 vascular access procedures for every vascular access infection–related hospitalization averted. A common source of bias in observational studies occurs when the degree of patient illness is associated with the treatment (or exposure) and the outcome of interest. In our study, bias would occur if sicker patients are seen more frequently by their outpatient providers and also are more likely to develop vascular access complications. However, we have previously reported that patient characteristics explain a tiny fraction of the variability in visit frequency (23). Rather, visit frequency varies primarily by facility characteristics and geography (23). This study has several limitations. First, it was an observational study and therefore subject to confounding and bias, despite our attempts to control for many patient, dialysis facility, and geographic characteristics. Second, while we observed the number of visits, we could not observe the quality of visits provided. It is possible that the duration and quality of visits decreased at higher visit frequencies. One study recently demonstrated that shorter visits to patients on hemodialysis were associated with a higher risk of death (29). Third, the generalizability of our findings to younger populations is limited because we studied only patients 67 years or older at initiation of hemodialysis; hospitalization and predialysis vascular access claims data for younger patients with ESRD (who, without a qualifying disability, would not receive Medicare benefits) would be incomplete. Fourth, we may not have fully ascertained all hospitalizations for vascular access infection in patients admitted for multiple reasons. Fifth, we were unaware of any vascular access surveillance programs that might have been in place in individual facilities around that time and how these programs might interface with visits from other care providers. Finally, a failing vascular access may prompt an immediate increase in visit frequency, confounding the causal direction between visit frequency and vascular access procedures. We address this issue of potential “reverse causality” by only considering as our exposure visits sufficiently distant in time from vascular access complications and procedures. In conclusion, this study demonstrates that more frequent provider visits were associated with more interventions aimed at preserving vascular access, but not with vascular access survival and only a slightly lower likelihood of hospitalization for vascular access–related infections. We highlight that vascular access care is an area where incentives put in place by Medicare do not appear to improve outcomes and may be associated with increased health care utilization. In hemodialysis, novel management strategies or alternative financial incentives will likely be required to improve vascular access outcomes. This work was conducted under a data use agreement between W.C.W. the National Institute of Diabetes and Digestive and Kidney Diseases (NIDDK). An NIDDK officer reviewed the manuscript and approved it for submission. The data reported here have been supplied by the US Renal Data System. The interpretation and reporting of these data are the responsibility of the author(s) and in no way should be seen as an official policy or interpretation of the United States government. The study was supported by F32-HS019178 from the Agency for Healthcare Research and Quality (K.F.E. ), K24-DK085446 from NIDDK (G.M.C. ), R37-AG036791 from the National Institute on Aging (J.B.), and T32-DK007357 from NIDDK. This article contains supplemental material online at http://cjasn.asnjournals.org/lookup/suppl/doi:10.2215/CJN.05540614/-/DCSupplemental. See related editorial, “Alternative Strategies Needed To Improve Vascular Access Outcomes,” on pages 172–173. U.S. Census Bureau: Statistical Abstract of the United States, Suitland, MD: U.S. Census Bureau, 2012.